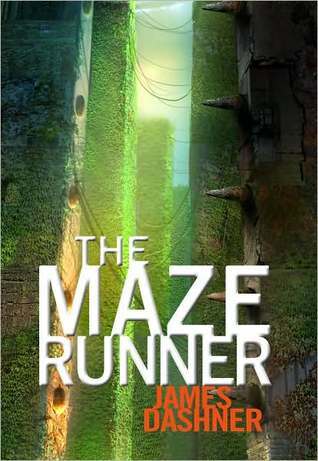 Book Review: The Maze Runner by James Dashner - Book.Blog.Bake. I bought The Maze Runner because it was a kindle daily deal, but I didn’t have super high expectations for this book because of all the mixed reviews I’ve read. Mainly, I thought this was a decently average book. Not bad or even mediocre, but not great. Bordering slightly on good, but nothing I’ll feel the need to re-read again any time soon. I had heard a lot of reviews say that the withholding of information went on too long, but I actually wasn’t bothered by that. While it is true that a good chunk of relevant information only comes about halfway through the book, the book was so quickly paced I didn’t realize I was actually in the middle of the book by the time the plot was really shining forth. The best thing I can say for the Maze Runner is that it’s exciting. Dashner writes the Maze and the Grievers, the terrible monsters that haunt the maze, incredibly frightening. I pictured the maze the entire time I was reading and what it would feel like to be in such a place. Even though the glade isn’t tiny and the maze expands for miles, I think it would feel extremely claustrophobic because of the lack of escape routes. Truly terrifying. The aspect that really brought The Maze Runner down for me was the lack of connection I felt to the characters. I know this is suppose to be an intelligent, action-packed story and not an emotional one, but to be at all invested I have to feel some emotional connections to the characters. I want to sympathize for them, feel their losses and victories, and in general, care about them, but I never really did. Thomas, the main character, was almost robotic in his actions. I found him annoying at times and tolerable at others, but I never connected with him. Since the stories focused around him, I didn’t get connected to the other characters around him either. Characters suffered severly and I felt nothing, and that’s not normal for me. I can mask my emotions around others pretty well but I’m really a deeply emotional person and for me to not feel anything when a fictional character suffers. I honestly don’t remember the last time that’s happened. Other than that, I thought the plot was really intriguing. I wanted more back story about what was happening with the world, but I didn’t necessarily expect anything because I knew going in this was mostly about the maze. The ending did feel a bit like a gimmicky set-up for the next book, but even though I knew what was coming, it still made my mind reel. I don’t think I’ll buy the next book in the series but I’ll definitely try to check it out from the library. Final Impression: This was a pretty average book for me. The strong points of the book are the plot and the pacing, both of which kept my mind racing and was the reason I stayed engage. However, the characters felt extremely flat and I couldn’t relate to them even a little bit, which dropped my rating quite a bit. I’m giving this one a 3/5 stars. I haven’t read this one yet, but the reviews are mixed and I want to give it a try. It’s a pity about the characters though! I dig character development in a review, so I’m a bit sad that this doesn’t seem to have that. Might give it a try anyway. Awesome review! I dig character development in a book, is what I meant to say. Apparently reviewing Soul Eater has dissolved the more functional parts of my brain.